The table below gives some physical properties for the first eight straight chained alkanes in the alkane homologous series. From the table of the straight chained alkanes it can be seen that there is a gradual change in the physical properties as the number of carbon atoms in the molecules increases. 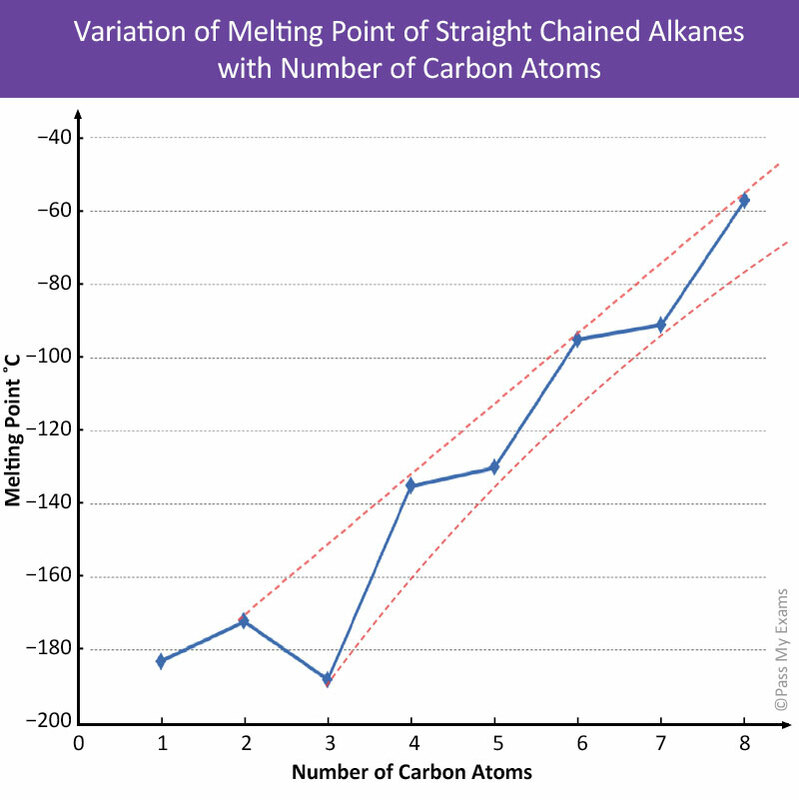 The graph below shows a smooth increase in boiling point with increasing number of carbon atoms for the first eight straight chained alkanes in the homologous series. This gradual variation makes it possible to predict properties of a compound from the properties of other members of its homologous series. The graph above shows a smooth gradual increase in boiling point with an increasing number of carbon atoms. This gradual variation makes it possible to predict properties of a compound from properties of other members of its homologous series. It is important to remember that during boiling and melting of simple molecules no covalent bonds are broken. The boiling point of a compound depends on the attractive forces between the molecules of the liquids. The stronger the attractive forces are, the more energy is required to overcome the intermolecular forces between the molecules in order to covert the liquid into vapour and so the higher is the boiling point. The increase in boiling point can be explained by understanding Van Der Waal forces. Although this topic is not required at GCSE level it is thought a brief introduction would be useful in order to explain the trends in boiling points for alkanes. Van der Waals’ forces are forces that exist between molecules and are therefore referred to as intermolecular forces. They are much weaker and different to the forces of attraction that exist between the bonds (ionic or covalent) of the atoms in a molecule which are referred to as intramolecular forces. Van der Waals’ forces are named after the Dutch scientist J D Van der Waal who discovered them. The forces are created by the constant movement of electrons in atoms of molecules at high speeds. At any instant in time there is the likelihood that one side of the molecule has a greater proportion of electrons. When this happens a temporary imbalance of the electrons result in the molecule producing a negative and positive end. An atom or molecule that has an imbalance in charge is called a dipole and a temporary imbalance in charge produces a temporary dipole. The temporary imbalance in charge or temporary dipole can attract the electron cloud from a neighbouring atom or molecule i.e. the slightly positive end of the temporary dipole will attract the electrons from a neighbouring molecule. This means the temporary dipole induces an imbalance of the electrons in the neighbouring molecule. The strength of the Van de Waals’ force is dependent on the size of the atoms or molecules. As the size and molecular mass of the molecule increases so does the number of electrons resulting in a greater imbalance in charge and hence a stronger Van der Waals’ attraction. This is the reason why the boiling points increase as the number of carbon atoms increase in alkanes, more energy is required to overcome the stronger Van der Waals’ forces of attraction. Each successive alkane in the homologous series has an additional CH2 (methylene group) added to the chain. This increases the size and molecular weight of the molecule and thereby the attractive forces between the molecules. However, as the molecular weight gets larger, the percentage increase by the addition of a CH2 group becomes smaller. 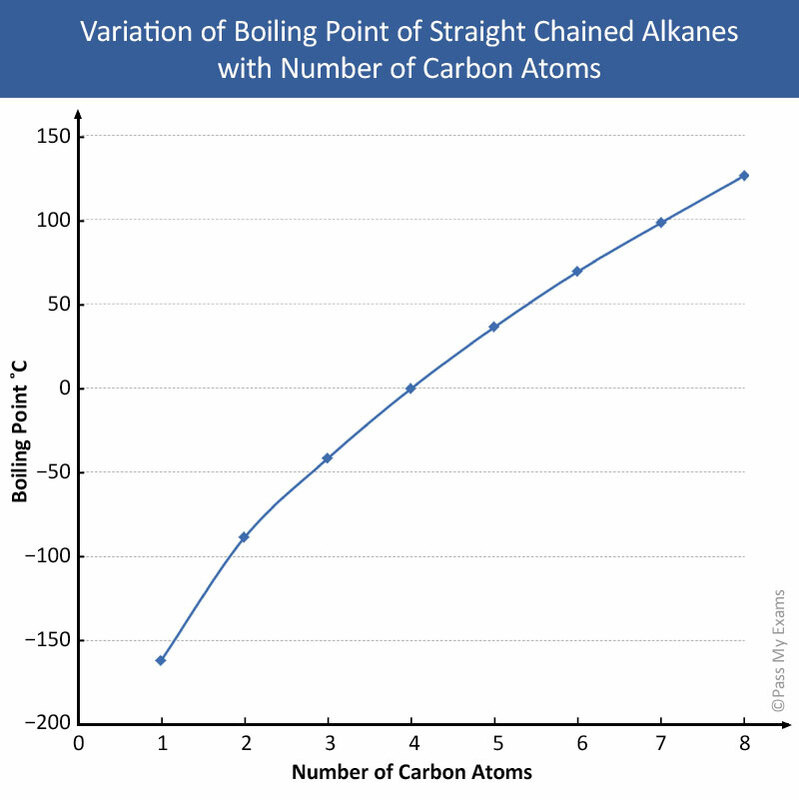 Thus, the difference in boiling points between consecutive members of the alkane homologous series decreases with the increase of a carbon atom, resulting in the smooth curve shown in the boiling point graph. It should be noted that for the first four straight chained alkanes in the homologous series the intra-molecular forces between the neighbouring molecules are so weak that they are gases at room temperature and pressure. By plotting a graph of the melting points for the straight chained alkanes in the homologous series, see below, it can be seen that the alkanes do not follow the smooth curve as was the case for boiling points. However, two separate curves can be plotted, one for alkanes with even number of carbon atoms and a lower one for those with an odd number. This is due to the molecular arrangements the alkanes adopt when in the solid state. In alkanes with an even number of carbon atoms the crystalline structure is such that the molecule chains pack closer together than alkanes with an odd number of carbon atoms. The tight packing of the molecules in the even numbered alkanes results in larger attractive intermolecular forces. Therefore, more energy is required to separate the molecules with even number of carbon atoms than those with odd numbers. The table below gives the density, viscosity and state of the first 8 straight chained alkanes in the alkane homologous series. The first four alkanes in the straight chain alkane homologous series are all gases at room temperature. The alkanes from pentane through to C16 are liquids with the remainder larger molecules being solids. All liquid alkanes are less dense than water and therefore float on it. The viscosity of liquid alkanes increases as the number of carbon atoms increase. The steady change in physical properties of the alkanes in the homologous series is caused by the steadily increasing molecular size. The increasing boiling point is due to the increasing intermolecular forces of attraction between molecules of increasing size. The first four alkanes in the series are small chain molecules and therefore have very weak intermolecular attractive forces. For this reason they have very low boiling points and exist as gases at room temperature and pressure. As the alkane molecules get larger the chains can align themselves in such arrangements that the intermolecular forces can operate along the whole length of the molecule. The increase in viscosity is also due to the increase in intermolecular forces between molecules of increasing size.